Pretty Bald: How do you store your Wig / Alternative Hair? If you only own or wear a single wig then storage is pretty straightforward! 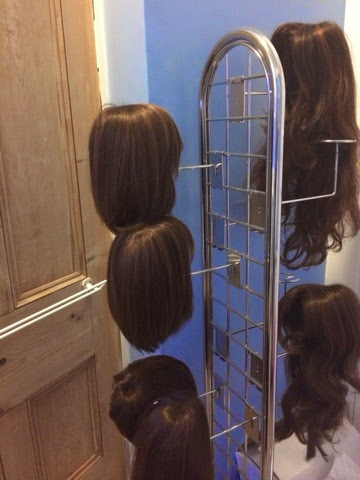 A head or wig stand available from most places will suffice and shouldn't take up too much room. I on the other hand own twelve different styles (with a desire for more), which I switch regularly and match to my outfit. Short, long, curly, straight, synthetic and human hair, I've got it covered; but with all of those wigs, just where do I store them? When I lived with my parents and had plenty of my own space, my wigs were everywhere; you'd find wig stands, heads, probably one over a lampshade* and one on the banister knob*! Then, I moved into my boyfriend's one bedroom flat where things were a lot less spacious! T is very supportive of me; my alopecia doesn't bother him and he still tells me I'm beautiful. He also won't stand in the way of me having wigs - as many as I want - but he drew the line at having twelve heads around his flat to store them. 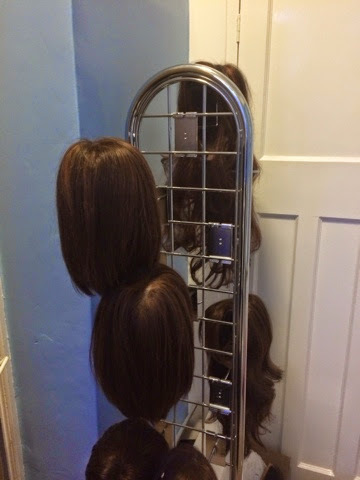 Apparantly it just isn't his kind of decor 😉 Anyway, when I moved in, I had to find a neat, compact and stable method for storing my wigs and one which kept them safe and secure! I puzzled and pondered but no matter how long I thought about it, I couldn't come up with a solution! Then I searched online for neat storage and came across a store fitting shop which offered gridwall in all sorts of formats, along with millinery hooks to support hats or similar items! As I couldn't drill holes to add gridwall to the walls, I opted for a freestanding metal unit; it has a wide foot and can support racks on both sides. I've bought millinery hooks (usually used for hats) and these fit nicely into the cap of the wig. Eh voila! I can adjust the height and distance apart and adapt it exactly to my wigs! T and my landlord were happy and my wigs are accessible! Thankfully, we've bought our own house together and things are a little less cramped, so I'm looking at some more stylish storage solutions, but if you're looking for an affordable, compact and accessible storage solution, gridwall can be great! I'll keep you posted if I find or opt for anything different in the near future!